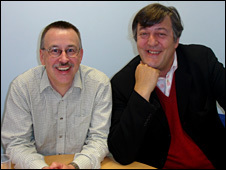 Stephen Fry is encouraging people with bipolar disorder to take part in a university's research into how genes can contribute to the illness. The actor, author and presenter has taken part in Cardiff University's study, along with TV personality Kerry Katona. Researchers need to double the number of the 3,000 volunteers who have so far donated DNA samples for analysis. Fry said volunteers would help "remove stigma, shame and hidden pain". Bipolar disorder, also known as manic depression, refers to severe episodes of mood disturbance ranging from depression to elation that affect a person's ability to function normally. It is thought to affect one in every 100 adults at some time during their life and men and women appear to be affected equally. Kate Wilkinson, diagnosed four years ago after completing a degree in Oxford, and is the study's 3,000th volunteer. She takes lithium to manage her condition - which she refers to as "fire-fighting". "Bipolar disorder has had a devastating effect on my life, triggering potentially life-threatening episodes of anorexia, mania and depression. "Being diagnosed with bipolar has meant taking various medications to manage my condition but there is no magic pill and it is largely a case of trial and error. "I cannot express strongly enough how important it is for anyone who has ever been affected by the condition to help with this research." The university said it is now well established that bipolar disorder runs in families and that genes play a role in influencing an individual's susceptibility to the illness. As part of the Wellcome Trust case control consortium - a major study looking at the genetics of common, complex diseases - researchers at the university, led by Professor Nick Craddock of the school of medicine, are trying to identify the many genes involved in bipolar disorder. They are also looking at how environmental factors may contribute. But Prof Craddok, who advised BBC1's EastEnders about a storyline where Stacey Slater was diagnosed with bipolar disorder, said more volunteers were needed "urgently". "Improving the lives of those with bipolar disorder requires an understanding of the causes and triggers of illness," he said. "Research is vital. It is fantastic that we have already seen 3,000 people but we urgently need more volunteers to get to the 6,000 people we know are needed to understand this complex, serious and often fatal illness." Fry, who has spoken openly about his struggles with the disorder, urged others to follow him in taking part. "If you took time to participate in this study, you've no idea how much good you will be doing. It would be a wonderful, a kind, a graceful and a noble thing to do," he said. "So much good for so little effort. How you will glow. By choosing to assist one of the greatest problems facing human happiness you will have done your bit to help remove stigma, shame and hidden pain as well as hastening the day when we all understand the operations of mind and brain a little better." Kerry Katona, whose battle with bipolar disorder has also been publicly documented, has also taken part in the research, which has now reached its half-way mark after recruiting its 3,000th volunteer. Prof Craddock said they need another 3,000 people to complete the research and said they would like to hear from individuals who have experienced one or more episodes of high mood (called mania or hypomania) at any time during their life. Volunteers will be visited at home by a researcher who will ask about their experiences and symptoms as well as taking a small blood sample. Any information give would be in strict confidence.